One of the earliest signs of aging is a loss of fullness in the face. Subsequently, deep lines and creases tend to form in the nasolabial folds and marionette lines. Although a rather newer procedure, fat grafting also known as lipoinjection or fat transfer, harvests the patient’s own fat using micro lipo-aspiration techniques from areas that excess fat is stored. It is then purified “centrifused” and reinjected it into the patient where a deficit exists, creating an increased fullness in the desired area. Common sites that are used to withdraw the fat include the lower abdominal fat deposit, inner thighs, flanks and inner knees. One advantage of fat grafting versus dermal fillers is it is the patient’s own tissue and therefore is not subjected to rejection by the body. Another advantage is the body absorbs most fillers within three to nine months, forcing the patient to maintain a regular injection schedule as well as consistently increasing costs. 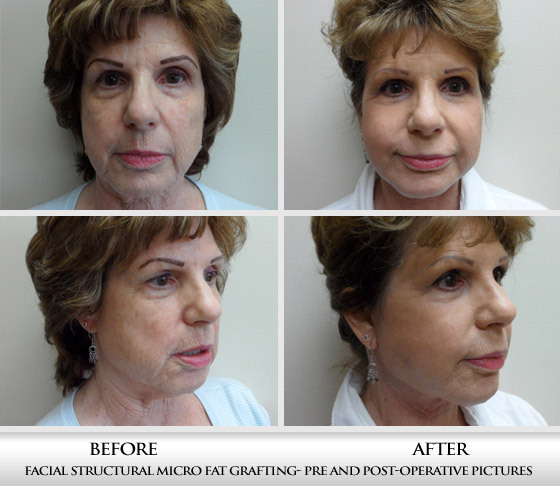 Fat grafting procedures are often done in conjunction with other cosmetic procedures such as facelifts and blepharoplasty (eyelid surgery) or as an independent procedure such as full face fat grafting, or hand rejuvenation. Dr. Chahin will discuss with you these procedures, and what is mutually felt to be the best method of treatment to aid in achieving optimal results for you.